Microsoft's plan to build a quantum computing ecosystem is based on Freedman's field of math and a branch of physics so seemingly mystical, it's early pioneers invoked philosophy and spirituality to describe it, and its later disciples attracted funding and support from self-help gurus in the 1970s, Allen said. Asserting that every piece of technology should help "embellish the capability of human beings", Microsoft CEO Satya Nadella underscored the need for technology to provide new levels of inclusiveness. 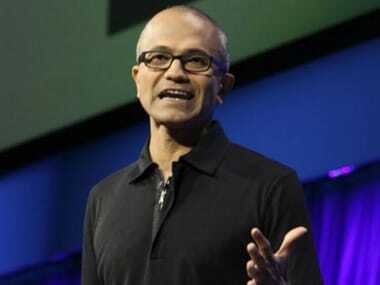 Satya Nadella, Microsoft's new CEO. IBNLive. "We want technology to provide new levels of inclusiveness. In fact, Im most excited about accessibility," he said. Satya's key note address was being simultaneously translated using AI (Artificial Intelligence) into 12 languages. "How can we bring more people into as full participants in our society, in our economy, using technology? How can we make sure that theres no bias built into technology?" he said. "Technology also needs to build the trust. Trust in how we secure data, how we ensure privacy, and the control and transparency that we build all around. "These timeless values and this opportunity of digital transformation is what grounds us at Microsoft in our mission -- our mission to empower every person and every organisation on the planet to achieve more," he said. This is something that Microsoft takes very seriously -- each word in this mission, he said. "The ability to really make sure that were not only thinking about the person, but the institutions people build," he added. "We think about it at the global scale, but most importantly, for us, its not about our technology, it is about what you can do with technology to create your own technology, to have real impact in moving our society and economy forward. That's what is central to our mission," Nadella said. "In fact, technology trends and paradigms will come and go, but what will center us is this sense of purpose and mission?" he noted. In his key note address, Nadella said that this is a time where the profound impact of technology in everything that people do is so much deeper, so much broader, whether one is talking about precision agriculture, or precision medicine, the future of connected products, smart cities or smarter factories. "There isn't a single industry that isn't being transformed. We collectively have the opportunity to lead in this transformation," he said. Nadella said "while Microsoft's our mission remains constant, technology paradigms come and go". "Where before we held a worldview of a mobile-first, cloud-first world, that worldview is evolving to the new technology paradigm of the intelligent cloud and the intelligent edge," he said. Three characteristics define this shift: the move to multi-device, multi-sensory interactions; artificial intelligence driving predictive insights across devices; and a new fabric of serverless, or distributed, computing power, he added. In this new era, Microsoft is building systems of intelligence, virtuous cycles and new feedback loops that help create data and refine how one reasons over this data to gain insights from information. Aiming to empower people within an organisation, he said Microsoft is taking it a step further, to ensure they are also transforming the processes and functions surrounding them. Bing for Business combines data from the enterprise with public web results to produce a seamless experience that's intelligent, personal and contextual, he said.